I’m a big fan of Bleach created by Tite Kubo and after watching the second movie release The Diamond Dust Rebellion, I’ve upgraded myself to a die-hard fan. 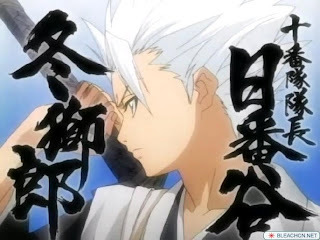 My favourite Shinigami Taicho (Soul Reaper Captain) is Toshiro Hitsugaya of the 10th Division in Gotei 13 whom I am dedicating this post to. If you are not a fan, check it out on the net for both the manga and anime. I guarantee you will be hooked. Captain Hitsugaya's zanpakutou is Hyourinmaru which literally means “ice ring”. Hyourinmaru’s spirit is a giant winged ice-dragon. In its sealed state, Hyourinmaru looks like a common Japanese katana with a unique tsuba (guard) design similar to a flower with four petals. To release Hyourinmaru’s shikai state, Hitsugaya recites the phrase "soten ni zase Hyourinmaru" translated as “sit upon the frozen heavens”. In shikai state, Hyourinmaru looks no much different with only an additional crescent blade attached by a long chain to the katana’s hilt. To release its more powerful bankai state, Hitsugaya commands the phrase "Bankai Daiguren Hyourinmaru" which means “great crimson lotus ice ring”. The katana tsuba (guard) changes to eight petals from the original four. 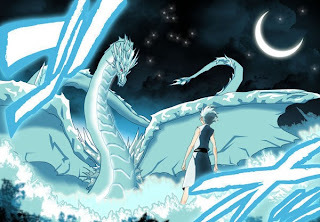 Ice partly covers Hitsugaya’s body to form two giant dragon wings on his back, a dragon tail, a dragon head frozen over his right hand and sword’s hilt, also dragon claws enveloping his left hand and both feet. Three huge flowers (with 4-petals each) similar to his sealed zanpakutou's tsuba appear behind Hitsugaya. Each of the petals fade away slowly as the bankai state prolongs. 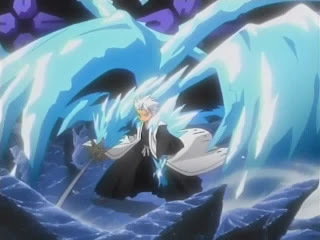 There are two special techniques Hitsugaya used in bankai state. The first is "ryuusenka" or “dragon hail flower” which freeze opponents that Hitsugaya stabs, imprisoning them in a cocoon of ice. The second technique is "sennen hyoro" or “thousand year ice prison” which envelops the enemy with pillars of ice and freezing them. In this post, we feature the elegant Hitsugaya sword replica Hyourinmaru, manufactured by Musashi. It is a full-tang functional sword replica with overall length of 42”, blade length 29.5” and handle length 12.5”. The blade is made of high-carbon steel with razor-sharp edge so take caution. The tsuka (handle) is hardwood wrapped in ray skin. The wooden scabbard is attached to a black back-strap which should have been green as shown in the anime (that should be easily taken care of). The Hitsugaya sword replica comes delivered in a sword bag placed inside a stunning long gift box decorated in red Chinese silk. 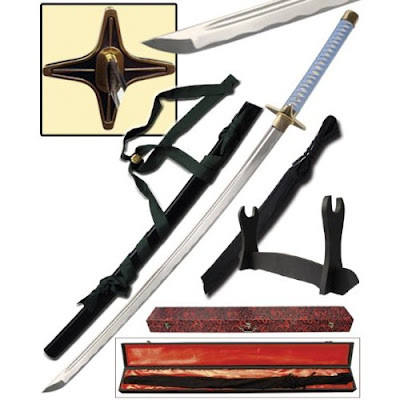 A display stand is also included and with the sword helps enhance the interior of your living room or study. 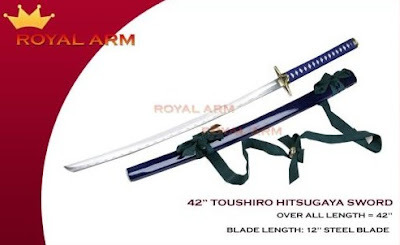 If you are looking for a functional sword, the Musashi Handmade Hitsugaya Sword replica Hyourinmaru is a good buy for its low price and quality. 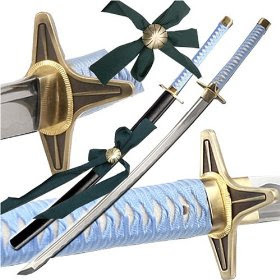 But if you just intend to use the sword as a decorative item, the 440 Stainless Steel Hitsugaya Sword replica Hyourinmaru from TopSwords is a better choice. For cosplay events, I would recommend the Wooden Hitsugaya sword replica Hyourinmaru from RoyalArm which is safe to handle even for a child.